It’s the Koh-I-Noor’s 125th birthday this year! Congratulations! This pencil just featured in Contrapuntalism’s latest blog post (last picture) and I also mentioned it in my previous blog post. If you are not familiar with the Koh-I-Noor: this is the pencil that might be the reason there are so many yellow pencils around, especially in North America. Petroski mentions a story in his book that describes how the L. & C. Hardtmuth Company picked yellow as the colour for this pencil because the flag of the Austro-Hungarian Empire (the same as the flag of the Habsburg Monarchy) was black and yellow1 – “and since the graphite was black, the pencil had to be painted golden yellow”2. Different Koh-I-Noor pencils, made in Austria and the Czech Republic – bought in the UK, Germany and China. Now before I go any further I have to to say that the two descendants of the original Koh-I-Noor share the heritage but not the pompousness of the original Koh-I-Noor. I fear they also don’t share the high quality of the old Koh-I-Noor pencils which were given “fourteen coats of golden-yellow lacquer, the ends of the pencils were sprayed with gold paint, lettering was applied in 16-carat gold leaf”3 or the effort made to protect it – a Manx cat and her offspring were protecting the store rooms of this pencil from mice4. The Koh-I-Noor’s look before 1852. Such a luxurious pencil needs a fitting name. The Koh-I-Noor pencil was named after the Koh-I-Noor diamond, a diamond from India that was once the largest known diamond. This diamond is set in the crown of Queen Elizabeth5 (That’s Queen Elizabeth, the wife of King George VI – not Queen Elizabeth II, the current queen). You can admire the Koh-I-Noor diamond in the Tower of London. It all started to go a bit pear shaped for the Koh-I-Noor pencil when, after WWII, companies in Czechoslovakia were nationalised. At that time there was no pencil production in Austria as earlier production was moved to Budweis – when the Austro-Hungarian Empire was still around. On the other side of the Iron Curtain the descendants of Joseph Hardtmuth, the founder of the company, managed to re-establish pencil production of the Koh-I-Noor in Upper Austria in 19506 and were also able to use the Hardtmuth and Koh-I-Noor trademarks. Much later, in 1996 production of the Austrian Koh-I-Noor pencils would move East to Austria’s state of Burgenland, an area which, in 1950, was in Austria’s Soviet-occupied zone7. Which of these companies is the ‘real’ Koh-I-Noor L. & C. Hardtmuth? It’s difficult to say even or especially in my very simplified version of the story. You could argue that the company in Budweis is the real successor. Pencils were made in the same factory as before the nationalisation. On the other hand you could also argue that the Western branch is the real successor. All seven shareholders as well as most senior staff flew Czechoslovakia when the company was nationalised8 and moved the company with them. The Austrian and Czech successors. For me both companies are successors of the original manufacturer. The company in Budweis does still exist. As mentioned earlier the Austrian branch moved to Burgenland. Their pencils are still being produced there. You can get Austrian made Koh-I-Noors, but there has been a change in ownership so the Koh-I-Noor pencils are now being sold under the name Cretacolor. You won’t find the successor, the Cretacolor 150, on Cretacolor’s web site, because of the web site’s focus on artists, but the 150 is selling well, not only in Austria, but also in countries like China9. 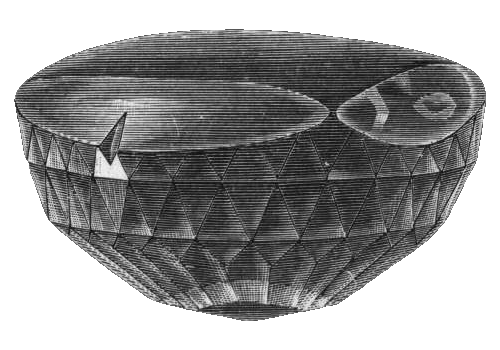 The image of the Koh-I-Noor originates from the Nordisk familjebok. The copyright for this image has expired. 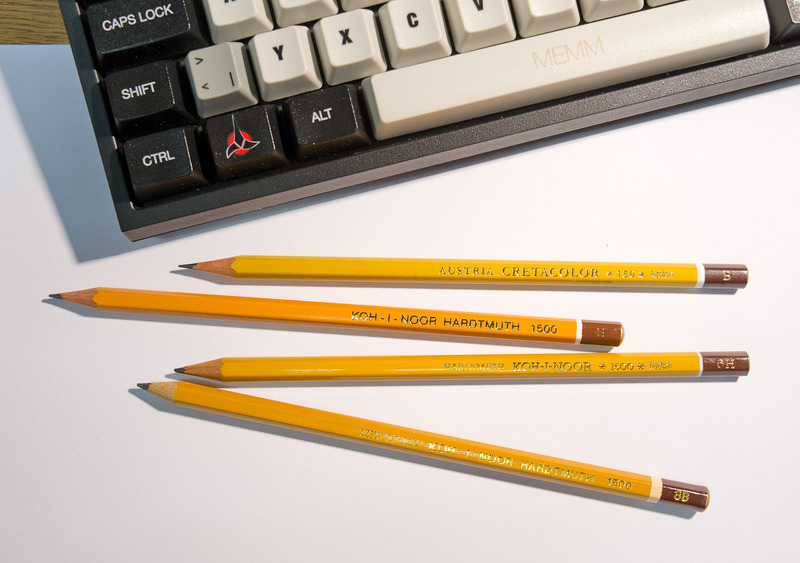 What I find amazing about the Koh-I-Noor is the number of wannabes it spawned – so many vintage pencils have this yellow-bodied, gold-lettered look! And speaking of Cretacolor, I liked their Monolith woodless pencil in HB very much. It came in an artist’s drawing set with darker grades. I wonder if the 150 writes well too? The original must have a really exceptional pencil if it is the ‘origin’ of the yellow pencil. If I come across a Monolith I should buy it. I don’t have the Cretacolor 150 (or the Koh-I-Noor 1500) in HB, but the B and H are not that exciting. They aren’t bad pencils, but for my taste they can’t compete with other inexpensive pencils, like the Staedtler Noris. One of the things that makes me pick other pencils over these is that their lines are quite light, but some people probably don’t mind – the FC Castell 9000 produces light lines, too, and is loved by many. My initial idea was that the Koh-I-Noor pencil dropped from being one of the best to being ok-ish when Koh-I-Noor was nationalised, but that doesn’t explain why it’s Austrian counterpart isn’t that much better either. Unless the Austrian side toned their version down, too, when they restarted pencil production in Austria, maybe to save money – resources were probably scarce at that time anyway. Thank you for these details about this classic pencil! The quality of the lead doesn’t impress me either so I like the Cretacolor 150 more for its design. – By the way, the Quality Austria logo (“Austria” on the Cretacolor 150 in the last photo) has changed in the last years so this may help when dating some Austrian pencil. My experience of Koh-I-Noor is mainly through their 5.6mm, and 2mm leadholders, which are pretty good, and very reasonably priced. the artist grade Cretacolor 160 (Cleos) is a very nice pencil. Daler Rowney Graphic pencils are made in Austria and i’m fairly certain the lead in these pencils is the same as the Cretacolor 160. This might sound pedantic, but the black and yellow flag is that of Empire of Austria, not the Austro-Hungarian “Dual Monarchy.” The flag of the Kingdom of Hungary was different, being red-white-green, and the flag of the Dual Monarchy was different yet again, being red-white-red. It was all very complicated, like the Dual Monarchy itself. The Cretacolor drawing/drafting pencils are great. I’m an civil engineering student and use them in the field for survey notes and have always had good experiences with them. When I got that information I tried to look it up, didn’t see it directly, but saw that it was the flag of the Austrian Empire and also of the Kingdom of Hungary. Sorry for the mistake if it’s not the flag of the Austro-Hungarian “Dual Monarchy”. Maybe the black and yellow flag was still on people’s minds as it was used until at least 1867. I feel I should ‘fix’ the blog post, but am not sure yet how. If you read the Swiss documents you’ll see that the rest of the blog post is actually an extreme simplification: Joseph Hardtmuth’s descendants restarted in France, but got their products from the existing Hardtmuth company in Austria – but I didn’t want to make the blog post even more complicated. Which Cretacolor pencils (model?) are you using? Are they common where you study? Rick, I have now changed the text of the blog post to incorporate your corrections. Thanks. I use the Cretacolor Fine Art Graphite 160 pencils in either 2B or 3B hardness. It might sound silly, but I like the rich carmine red paint on them! They are not common here in Baltimore on the east coast of the United States, and I have to make a special trip to one particular art supply store to get them. Office supply stores and other places here only carry pencils in the “No. 2 – HB” grade which seems to be standard for schools. Because Baltimore is home to the Maryland Institute College of Art, the area can support four very nice art supply merchants. Each store carries two or three different brands of artists and drafting pencils. I like B or 2B hardness leads in my mechanical pencils, and I use .09 mm, 1.1 mm or 1.3 mm pencils because I “write heavily” and tend to break leads of lesser thicknesses. Thanks for this information. I noticed that the Lynda instruction videos (I can access them through my employer) that teach drawing with pencils show the 160 (I came across it when installing Lynda on my phone). I haven’t tried it yet, though. Now that you praised them (even though it’s for their paint) I will buy one when I see one. I do like soft leads in a mechanical pencil – more than in a wood cased pencil, so if it wasn’T for smudging I’d use them a lot. If you use leads > 1mm do you sharpen them? Well, I like the Cretacolor for more than the color, because I do think it writes very cleanly and evenly, but the color does look nice. I don’t really have a favorite wooden pencil, nor do I have a favorite mechanical pencil. I switch off between them. I have learned that there is NO standard for lead hardness within one country much less internationally. This is something that does irk me sometimes. For example, the Dixon Ticonderoga No. 1 B grade is very much harder than the General Sexi-Hex No. 1 B. The Derwent Graphic 3B is much softer than the General Kimberly 525 3B. A friend of mine here at college is a mechanical engineering major, and he and I are trying to design a machine that will test a battery of pencils using a uniform pressure so the hardness can be compared. I suppose, between my wooden and mechanical pencils, and switching back and forth between them, I’m as much of a writing tools junkie as the fountain pen addicts. I do use fountain pens almost exclusively in class and home and use only Diamine Prussian Blue, bottled and cartridges. All of my pens are inexpensive ones and all seem to write just as well if not better than the high-end ones I’ve tried at pen shows. Have a great weekend! I’m off now to the joys of learning about stress in reinforced concrete. Oh. Forgot to answer your question. No, I don’t sharpen mechanical pencil leads.